Today I pulled apart the bike and checked the wiring for the accessory power outlet that I’d added two years ago. Contrary to my previous doubts, I found that the positive cable originated at the main fuse, and the negative (ground) terminated on the frame under the seat. Both these locations are about a close to the battery as you can get. I also checked the configuration of the relay, and confirmed that was OK.
Just to be sure, I rigged up another cable, directly to the battery, and started running some tests. AutoCom and VIO POV both connected to bike power, with the engine running: Lots of noise on the VIO POV recording, but none in my helmet. AutoCom and VIO POV connected to bike power, but through a 20A noise supressor: Lots of noise on the recording, but with some of the lower frequencies gone. AutoCom connected to bike power, and VIO POV running on AA batteries: a faint, high pitched noise on the recording, but otherwise clear audio. The VIO POV connected to bike power and not connected to anything else (ie using its own microphone): lots of noise, as before. This is enough to convince me that the bike power is fine the way it is, and the VIO POV will be running on AA batteries from now on. I also tested the Push To Talk switch, and found that the 3.5mm plug and socket that I’d added to make the PTT switch removable is pretty flaky. I’ll be looking around for an alternative connector for that. Pulling the bike apart gave me an opportunity to clean parts of it that normally get missed. There’s still a lot of red dust in hard to reach places, so I dismantled a few things to clean that off. As part of the original setup for the Trip, I bought an AutoCom ActivePLUS, which connected my iPod, my phone, and my UHF radio, and routed the sound through to my helmet. The other thing it did was feed all of that sound through to my helmet camera. One of the things I’d hoped to do was capture some commentary of my own and radio chatter from the rest of the party as a way of narrating the video. Trust me… helmet camera footage is interesting for all of 30 seconds, music or no music. One of the things that got in the way of that plan (and there were a few) was electrical noise. All the comms gear was powered off the bike, and all the helmet camera video I recorded was infected with a whining noise which changed pitch with the bike’s engine revs. I was aware of the problem before the Trip, and bought a noise supressor which was meant to resolve the issue. It didn’t. Last weekend I bought a larger noise supressor, and started running some tests on gear powered off the bike. Using the AutoCom and the helmet camera, I ran a series of tests with various combinations of bike power and battery power. What I found was that, even with the filter in place, the helmet camera picked up a lot of noise when powered off the bike. The AutoCom itself seemed to remain reasonably clear on bike power, though the helmet camera (running off batteries) still picked up some electrical noise from the AutoCom. Both these gadgets are designed to be fitted to a bike, so it came as a bit of a surprise that both would be so susceptible to electrical noise. I started searching the ‘net, trying to understand the nature and cause of electrical noise, and found that the most common cause was a poor ground (or negative) connection. I started looking at the photos I’d taken when I first added the SAE cable that powers the tank bag, and I think I might have found a clue. The positive lead runs near enough to straight from the battery, so that should be reasonably clean. From there it runs to a relay behind the instrument panel. The trigger wire on the relay comes off the instrument backlights (which are always on when the bike is running). Again, this shouldn’t be a problem, since the switch side of the relay is isolated from the power it’s switching. The weak point, as expected, is the ground. Rather than go back to the frame, or all the way back to the negative terminal on the battery, I attached the ground to a negative wire off the back of the instruments. I can’t be sure, but I think that’s the weak point. The next step is to rerun the auxiliary power on the bike, with positive and negative originating as close to the battery as possible. From there I’ll break out only for the relay, and use the same trigger source as before. Managed to get some great work done on the bike over the weekend. A few weeks ago I ordered the Wolfman Large Expedition tank bag (in black), ProiTaper ATV Hi handlebars and a bunch of cables and connectors. They finally came, so I worked out what smaller bits I would need, bought those, and got to work. I took a couple of phone-photos of the OEM bars in their current position in case I needed to compare them later, but in the end it was the front fairing and the dashboard that decided the angle of the bars. I’ve been holding off on buying a riser kit, but I think I’ll get one now. The new bars are almost the same bend as the stockers, which means they’re just a little too low when I’m standing up. Amongst the gear that I’d ordered (and waited some time for) from BlueRim were a couple of fused SAE wiring harnesses. I decided to go for these instead of a dashboard or handlebar-mounted Powerlet socket, since a mounted socket would require a connecting lead, which is both more expense and something else to go wrong down the track. The cable I’d purchased was long enough to reach from the battery to the tank bag, but I ended up deviating from my original plan and adding in a relay, so that the tank bag would turn on and off with the ignition switch. By the time I’d run the cable from the battery to the dashboard (where I’d mounted the relay and sourced the switched power) to the tank bag, it was all too short. Since I had to cut the cable to add the relay anyway, I spliced in some extra cable, and it worked out pretty well. I sourced the main power from the main fuse under the seat, just near the generator. This is the same as taking power straight from the + terminal on the battery, but the location is better. The switched power from the relay came off one of the dashboard backlights (which, it turned out, had a blown bulb). I routed the connector itself up through the handlebars and used the tether on the end-cap to keep it in place. It seems to work pretty well there, and the cable is stiff enough that it isn’t going to move. rubber, and there’s a metal plate inside the bag that clamps the whole thing in place. On the inside I added a double adapter, so I now have 2 SAE connectors inside the bag. All-up, it came out looking pretty sweet. I removed the cigarette lighter plug from the end of a 3-way lighter-socket powerboard, and replaced it with an SAE connector, and hooked that up to the inside plug on the bag. I also fitted a cigarette lighter plug on the AutoCom, and connected that to the power outlet, along with my Belkin iPod car charger. I connected the iPod and my mobile phone to the AutoCom, conntected the whole thing to the bike, and tested it. Apart from the mic not registering on the phone, the whole thing worked quite nicely. The AutoCom fades the music when you speak, and it really does cancel out background noise and wind (well, all I did was blow in the microphone, but it seems to work). More to follow on the push-to-talk switch and other tank-bag gadgets… but it’s coming together. My new Autcom Active-PLUS arrived the other day. The unit looks much the same as the photos, though I was surprised to see that the connections for rider, pillion and UHF radio are all full-sized DIN plugs. I’d guessed that they’d be mini-DIN plugs – much like a mouse or keyboard plug – since that’s what I’d had on my old Aldi helmet radio system. Not that it matters. I might just need to rethink how the cables come out of the tank bag, since I don’t think the access ports I was looking at would be large enough. The leads from the main unit are reasonably long (though the pillion lead is shorter than the rider’s, so I guess they’re expecting it to be mounted at the back of the bike) so I won’t need both the supplied extension leads. I’ll sacrifice one of these and get it turned into an adapter for my throat mic and earmolds. 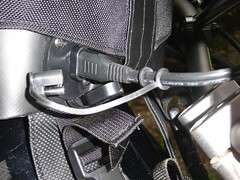 I’ve managed to find an image of the pin-outs for the rider/pillion leads, and for the UHF lead. This will run from the battery to the front of the bike. I was originally planning to terminate the power supply at a nice Powerlet socket with a lit, but looking at the cost, the effort of drilling the dash area etc, I’ve decided that an SAE connector with a rubber cap, clipped up under the fairing, will do the job. I can also tailor the length of lead I have available so it exactly reaches the bag. It can be clipped out of the way when not in use. This is an access port through the material of the tank bag. It’s basically an SAE connector on both sides, with a plastic sandwich plate to hold it all in place. I’ll add a second one of these for the PTT switch, which I’ll get to in a moment. Inside the bag, I want to power 2 banks of cigarette lighter sockets. At this point I have 6 devices inside the bag that need to be powered, so 2 banks of 3 or 4 sockets will do the trick. Anyway, each of these will connect back to the power supply via an SAE plug. As reluctant as I am to spend money on what is essentially a push-button, I think in the end I’ll have to. I’ll chop the switch lead from the rest of the harness and add in some SAE connectors, so that I can remove the tank bag and leave the PTT switch behind. I’ll need to decide whether I buy a separate adapter cable for the UHF radio I choose, or just remove the plug from the end of the harness and put the right connectors on the end. Since it’s all in the tank bag, it won’t need to be waterproof, or particularly long. The rider and pillion leads will just go out the top of the bag, I think… the plugs are too large to use access ports. Wow… it’s a bit sad when my twitter feed is generating more blog posts than I am. Need to remedy that. Last week I ordered an Autocom Active PLUS from a reseller on eBay. It pays to shop around for these, since the one I bought got undercut by another reseller a few ours before I purchased, and I missed it. Also, by the looks of Autocom’s UK site, they’re replacing their entire model range, so there’s a good chance that all the existing models will start to drop in price in the next few months. Anyway, I’ll soon be kitted up for iPod, phone, UHF radio and GPS chatter in my ears. I’ll need to get a an adapter made up for my Earmolds and my Noise Terminator throat mic, but that shouldn’t be too hard. In the meantime, the kit comes with two complete helmet setups, so I can at least test it with one of those. At this point I’m still leaning toward a tank bag as the means of housing the Autocomm and all the associated gadgets. The Wolfman Expedition is probably winning – I’ll wedge all the power adapters etc in the bottom corner of it, and put a false floor over that. I’ll need to feed lines out for power, GPS and the PTT switch at the front, and for the mic/headphone jack at the back. Should be a nice setup when it’s done. I’ve also ordered a bash plate from JNS Engineering in the states. I was able to share the postage with a couple of other guys… pretty happy about that. I’m figuring that most of my gadgetry on any trip would be kept in luggage, rather than bolted to the bike. This will allow the entire setup to be removable, not to mention water and dust resistant. The most logical place or all that is a tank bag, or better still a self-contained padded bag inside the tank bag, that can be moved to a larger or smaller tank bag (or somewhere else entirely) fairly easily. So the next challenge is getting the power into the tank bag itself. 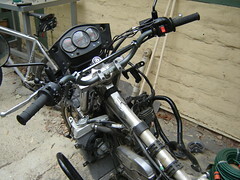 I’m planning on placing power outlets on the handlebars of the bike, so the power source will be close at hand. This page at Eastern Beaver gives a great outline on how to power a tank bag. I’d follow this procedure almost exactly, though I expect that I’d run an SAE connector cable to the inner bag, and distribute power from there. The other thing I’d add to the outside of the tank bag is a couple of these Power Ports. One at the front of the bag would allow the GPS on the handlebars to connect to an integrated comms system inside the bag; another on the back would allow connections to a helmet microphone, speakers, and a helmet camera. iPod: a Belkin cigarette lighter adapter would be perfect. It has a line out and a volume control, which will allow the iPod to connect into the integrated comms system. The adapter and the audio wiring would all be hidden in the wiring section, with only the dock connector visible. This will need a cigarette lighter socket. Mobile Phone: on shorter trips (where I wouldn’t bother with all this kit) I’d pair the phone to the Bluetooth radio on the GPS, and pair that to the bluetooth headset on my helmet (more on that when I work out what GPS I’m after). In this scenario, though, I’ll pair the phone to the comms system, and power it off the bike. Wiring would either be a cigarette lighter socket or a direct connection, depending on the voltage. UHF Radio: power and comms would be wired to the radio. This will probably be 6v, so an adapter will be required, I guess. Which means another cigarette lighter socket. Comms Integrator: there are a number of these units available. The handle noise supressions, and route sound to and from the helmet to the various devices. I’ll look into these in greater detail another time. Helmet Camera recording unit: the latest helmet cameras record to SD card, rather than connect to a DV camera. I’ll generally keep mine in the tank bag, an while it is there it might as well be charging. Don’t know yet what connector I’ll need for that. Video Camera or Camera Battery Charger: the plan is to video the trip, so I’ll want to have my DV/HDV camera handy. Again, since it is in the tank bag anyway, it might as well be powered. With all of that, the simplest approach might yet be to have a mounted strip of cigarette lighter sockets inside the tank bag, and protective cases for each of the gadgets. Time and testing will tell. More on that when I’m ready to start shopping.